Colorado at its rugged best... the Indians had a phrase for this unique area of the majestic San Juan Mountain Range - 'Where the Gods fly.' Your residence is set in an aspen/pine forest at 8400' perched on a Rocky Mountain cliff side beneath the rugged 11,000' rock formation named the Hermosa Cliffs. We offer a true intimate family setting with outstanding views and total privacy. Seventeen miles north of town, Pine Point is a convenient four miles away from the Durango Mountain Resort which offers activities throughout the year. What makes this property unusual are the two separate residences attached by intercom allowing families or friends to have both access and privacy. The upper main residence is a two bedroom/one bath living space which includes a cathedralesque great room with incredible views and a twenty five foot/south facing wall of glass. The wrap-around deck provides more than (300) sq. 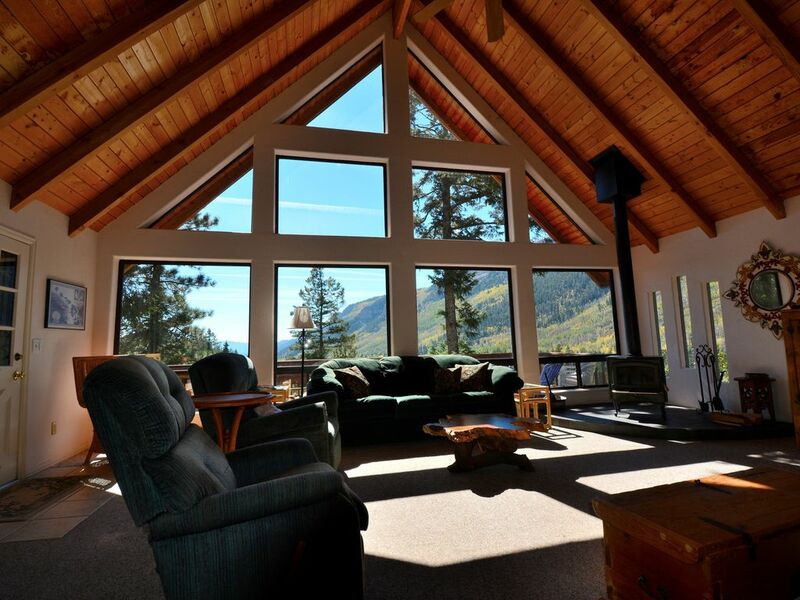 ft. of additional outdoor living space and expansive views carved by ancient glaciers winding down the Durango Valley. From the deck or from the great room, guests often feel as if they are standing in mid-air. Downstairs (under the upper deck) is a separate studio apartment complete with a kitchen, bath, and private deck. With its 270 degrees of glass, this space is perfect for a couple and was originally designed for parents to find refuge from their teenage children. You are within walking distance of two spectacular lakes, Electra and Havilland. Electra Lake features twelve thousand foot peaks covered with snow most of the year and is less than a half mile from your front door. The lake is coveted by fishermen and mountain bikers alike and considered to be one of the most stunning in all of Colorado. There is a fee to enter. You are also four miles from a world-class ski and hiking resort. The close proximity of Pine Point to the Durango Mountain Resort affords an active family or group the best of all worlds - excellent public recreation areas and a warm, totally private house which feels like home. It must be noted that the second bedroom upstairs in the main house is small and we have decided that it be deemed appropriate for one person instead of two in spite of the queen bed. Historically, we first considered it a two person room. Pine Point in Durango is indeed one of those undiscovered spots in the world which forms an indelible impression once you are there. Our family lives year round in a 1909 house overlooking the Pacific Ocean in Santa Barbara. in 1992 we decided to look for an equally spectacular mountain residence... we wanted something undiscovered - not Mammoth or Aspen or Jackson Hole. We wanted an experience that encompassed a spectacular view with a modest home that reflected our values. Living at Pine Point includes living among wild animals, soaring birds of prey, and the feeling that you are midway between the wild and the center of town. Again, what makes our property stand out from others is the fact that our studio apartment offers a separate residence for guests who fall into the 'separate couples' category or for 'parents and children' spending their summer vacations together. Too often a mutual friend vacation or a family vacation is anything but a vacation...there is never enough space for couples or different generations to feel as if they have any privacy. At 8400', the mornings are cool and sunny, the afternoons shaded by tall pines complete with mountain breezes. During June, the rivers run high with winter snow runoff and the wildflowers begin to flourish. In July, dramatic thunderstorms arrive as quickly as they disappear in the afternoons and the bears begin to occasionally pass by as all guests are asked to bring in any food at night. August temperatures are somewhat cooler and in many ways August is the most interesting month as the smell of Fall slowly comes to play. Fall is absolutely our favorite time of year especially the last two weeks of September and the first two weeks of October. (These weeks will not be available when we retire.) The aspen turn bright orange and yellow as the scrub oaks turn flaming red. We seldom have people who come to Pine Point to just look at the snow. Most go four miles north to ski at Durango Mountain Resort. It is important to remember that winter is challenging in the Rockies. Although the scenery around you is mesmerizing and seemingly endless, the entire area including the main highway requires 4WD or chains without exception. For those who do seek to ski, it is as good as it gets on the Mountain. Spring at Pine Point is often sunny and relatively warm during the day and cold at night with temperatures approximately ranging from 30-60 degrees. It is a beautiful time to relax and watch the last of the snow melt as the elk migrate to higher elevations and the birds begin their dance. *** So if you decide to visit this semi-tamed part of the southern Rockies, be sure to understand that this is not the same as living in a resort condo or in the middle of nowhere. It is a personal experience as many of our guests return year after year. Reservations are best made pretty far in advance. Lic # 27274919. The decision to establish roots in Durango was a very personal choice for our family. In 1992, our youngest daughter was granted a wish from the Make-A-Wish Foundation and our family of six flew to Disney World for a week of non-stop stimulation. When we returned to California, we were determined to fulfill another wish of hers - to find a place in the mountains with big trees and wild animals that we could all enjoy as a family. After considering Ashland in Oregon, Flagstaff in Arizona, and Lake Tahoe in California, we were referred to Durango by a friend. The locals were so warm and without pretense that we immediately felt comfortable in the setting. There was so much to do, so many places to see, that we were sure that we had found what we were looking for. It's been twenty years since we were fortunate enough to find Pine Point. Thankfully, everyone in the family is healthy and now we experience the area with our grandchildren as well. Sharing our home with other families has always been part of the plan. Living on the West Coast for the past forty years, our family has always enjoyed a true mountain experience away from the beaten path yet appreciates the amenities provided by city culture. The Needles range of the San Juan Mountains provides such an experience as does the city of Durango with its fine restaurants and diverse cultural opportunities even though it has a population of just 17,000. When we first purchased this home it was a 600 sq ft summer cabin without a well, heat, or decks to take advantage of the amazing views. We have doubled the size of the house anchored by a twenty five foot south-facing wall of glass to make living indoors seem like living outdoors. The challenge of continually upgrading the living experience at Pine Point with the input of guests and friends has always been and continues to be rewarding. Many of our guests come back or refer their friends. We are confident that you will feel the same way. The setting is not only stunning, but a perfect distance (17 miles) and a great drive south to town, and in the other direction yet another memorable drive (25 miles) north to Silverton, Ouray, Telluride, and the original 'Million Dollar Highway.' With two lakes within walking distance, an abundance of trails in any direction, and the immediate glacial views of the Hermosa Cliffs, it is no wonder that the locals refer to this area as the Gold Coast of Durango. But perhaps the most unique aspect of our home is the downstairs apartment. As parents of four children, we designed this space to be a sanctuary away from everyday family life complete with a kitchen, bath, and 270 degrees of glass to take advantage of the views and peacefulness. An intercom and outside stairway connects the two living spaces. The arrangement has worked incredibly well for everyone as our children are able to enjoy their own space as well. * note - sometimes, families decide that the teenagers use the apartment which seems to suit everyone just fine. Parents then use the enclosed master bedroom with views in the upstairs loft.